Today we take beer for granted as being a refreshing adult beverage to enjoy in our leisure time, and as consumers we are particular about what styles and brands we choose based on our personal preferences. In the very early days of human civilization however, beer was much more. Beer was the source of life for our ancestors and was a necessity as much as food and shelter. The act of brewing beer coincides directly with the first archaeological evidence of people getting together and living in larger groups. In fact, many argue that there appears to be a 'chicken or the egg' scenario where it is hard to decipher whether people developed agriculture and beer just happened to be one of the first products produced, or if agriculture itself came out of the desire to have more ingredients to brew beer. Either way, cereal grains including emmer and barley were among the first crops raised by humans and both were fermented to make beer. In the cradle of civilization near present day Iraq, the Sumerians were brewing beer by 4000 BC. 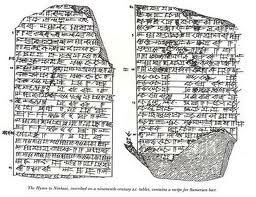 A cuneiform tablet containing a lyric text known as the 'Hymn to Ninkasi' was dated to around 1800 BC and contains a crude recipe for brewing beer. Ninkasi was the goddess of beer to the Sumerians and held an extremely important role. Though there is still some debate as to the particular processes involved, many agree that barley was malted, natural enzymes were used to mash the barley and extract sugars, and the final product was fermented for some period of time with wild yeast. By the time of King Hammurabi of Babylon, beer was such an important part of life that laws needed to be developed to protect its purity and to make sure people were getting enough. Hammurabi ordered that workers receive 2 liters of beer a day, civil servants got 3 and administrative officials and high priests were given 5 liters of beer PER DAY! For those who aren't metrically inclined, there are 3.8 liters to the gallon. That's a lot of beer! Hammurabi also wrote that tavern keepers who were caught cheating their customers on a pour of beer would be thrown into the river... He also codified the first beer styles guidelines differentiating styles from each other. He was serious about his beer. Why all of the fuss about beer in these early days? It's because for these early civilizations, beer was a source of life. Our ancestors figured out fermentation long before they figured out sewer systems, and because of beer they were able to survive the squalor that was rampant in these early cities. In those days, your neighbor would dump his chamber pot into the river upstream in the morning and you would collect your drinking water for the day downstream. Obviously, the water supplies were contaminated and water-borne illnesses were devastating until better systems were developed. Beer, however, was boiled during its making, thus sanitizing the water, and then it was fermented to create alcohol which kept the bacteria at bay after fermentation was complete. As you can see, though these early city dwellers didn't know exactly why, they definitely learned that those who drank a lot of water got terribly sick and those who drank a lot of beer stayed healthy. And it helped that the beers of those days were not the six and ten percent craft creations we love today but very low alcohol beers that had limited intoxicating effect. Also, beer was a great way to store the year's barley harvest. While barley would rot in a short amount of time after picking, beer would store the nutrients and calories of the barley in a form that lasted longer. This idea is similar to that of raising livestock. Animals become a savings account for the year's crops. Beer was likely used the same way. When people think of the birth of craft beer in the US, many brewery names are thrown around. Heads will be nodded in the directions of Sierra Nevada, Boston Beer (Sam Adams), Anchor Brewing and a few others. One name that is often left out of the conversation is New Albion. Though the brewery ceased operations over thirty years ago and never got beer into markets farther than a day's drive from their Northern California location, New Albion and its founder Jack McAuliffe earned the title of first craft brewery in the US since the repeal of prohibition. In 1976, Jack McAuliffe, a former Navy man, opened a small and ultimately unsuccessful brewery in Northern California. He didn't have much money, but he did have the ingenuity and mechanical skills to take old dairy equipment and other salvage yard items and turn them into a brewery capable of producing great beer. The name New Albion was a reference to the name Sir Francis Drake gave to Northern California when he explored its coast. The logo on the bottles was of Raleigh's ship, The Golden Hinde. The beer inside the bottles was the first American Pale Ale. Bright citrusy hops grown near the brewery were used for flavor and aroma in a way that brewers hadn't used them before. The result of McAuliffe's work was well received but a lack of financing kept him from being able to produce enough beer to turn a profit. Investors at that time didn't know what to think of a man who slept in his own brewery and made a product that no one had seen before. It was difficult to convince people that though he had no intention of competing with the big brewers in St Louis and Golden his hand crafted product could be profitable. New Albion ran out of money and closed its doors in 1982. In those six years though, New Albion helped pave the way for other craft brewers. First, one of the major obstacles to New Albion's success was legislation in California that prevented McAuliffe from selling his beer on the premises of the brewery. He had to sell it to a retailer who would then sell it to customers. Working with Fritz Maytag of Anchor Brewing and with many vineyards throughout the state, McAuliffe successfully petitioned the state to change the law making tasting rooms for wine and beer possible. Still today, many small breweries rely on the higher profits of on premise sales to fund their operations. Also, McAuliffe's brewery was an inspiration to those who visited and continues to be used as a model for underfunded brewers starting in the business. One of those underfunded visitors was a young man named Ken Grossman. He visited New Albion several times and used it as a model to start a brewery called Sierra Nevada. In fact, the pale ale Sierra Nevada brews was inspired by the one Grossman had at New Albion. Though personally unsuccessful, New Albion's legacy sparked the craft beer movement in America. When the brewery's name came up for auction several years ago Jim Koch of Boston Beer Company bought the rights. This past year Boston Beer brewed a recreation of New Albion's pale ale and packaged it with the same logo McAuliffe used thirty years ago. Not only did Koch bring this craft ancestor back from the dead, he is working toward making sure that it doesn't disappear again. Though McAuliffe now lives off the grid somewhere in Arkansas, his daughter Renee DeLuca is working to revive her father's brand. Interestingly, it was only recently that she found out that McAuliffe is her dad. After finding out that McAuliffe had an heir, Jim Koch contacted her and gave her the rights to the New Albion name. In a final interesting twist, DeLuca is in talks with Mendocino Brewing, the company her father went to work for after New Albion closed, to contract brew New Albion beer for her until she builds her own facility. If you would like to keep up with the future of New Albion, DeLuca runs a blog called The Brewer's Daughter. The story of Jack McAuliffe and New Albion is one that I love to tell. That ingenuity, determination and creativity is still alive in craft breweries all over our country. Also, the collaborative efforts of brewers around the country for the betterment of the whole is rare in this competitive, undercutting business world. Koch's offer to give a valuable name to De Luca wouldn't happen in many other industries. I am constantly inspired by the kindness and generosity of those I meet in the beer world. If you'd like to hear more craft beer stories over a pint, join me on a BREW-ed tour.